Meeting Harsh Mander, one of India’s foremost activist-intellectuals and a courageous former civil servant, again revived the idea for me, but this time, beyond workers. I had first met the soft-spoken Mander in Karachi, when I worked for Geo TV. He had been part of a small delegation from India visiting Pakistan in early 2004, a visit aimed at improving understanding between India and Pakistan, organised by the social-cultural group Act Now for Harmony and Democracy (ANHAD). Mander, along with activist Shabnam Hashmi (sister of the slain theatre activist Safdar Hashmi) and Marxist historian Prof K N Panikkar, is one of the founding members of ANHAD, established in March 2003 in response to the massacre in Gujarat the previous year. The death and destruction in Gujarat in 2002 galvanised Indian intellectuals and activists as never before. Many of those who rose up then had long been fighting for justice, some publicly and some, like Mander, through the system. An Indian Administrative Services (IAS) officer who left his post in the aftermath of the Gujarat pogroms, he had been fighting the battle in his own way throughout his 22 years of service, refusing to fall prey to politics. Posted in various districts across India, he meticulously followed the letter and spirit of the law to tilt the balance in favour of the dispossessed. Just four years into service, as Additional Collector in Indore, he took the bold step of calling in the army to quell attacks on the district’s Sikh population in 1984 following Indira Gandhi’s assassination. “The District Magistrate and the Superintendent of Police had given instructions that unless they personally ordered force, none was to be used; then they disappeared. And in two hours I saw things that I hoped never to see again but have seen too often,” Mander told the Business Standard in a 2015 interview. Remembering that the senior-most magistrate on the spot – in this case himself – is authorised to call in the army, he moved quickly to do so. With shoot-at-sight orders and curfew imposed, the violence was quelled within six hours – unlike places where it dragged on for weeks – all “because one greenhorn officer just took a decision”. The tipping point for him was the Gujarat carnage. He realised then that “there are many battles you can fight within government but when the Constitution itself is challenged then you have to fight the battles outside”. 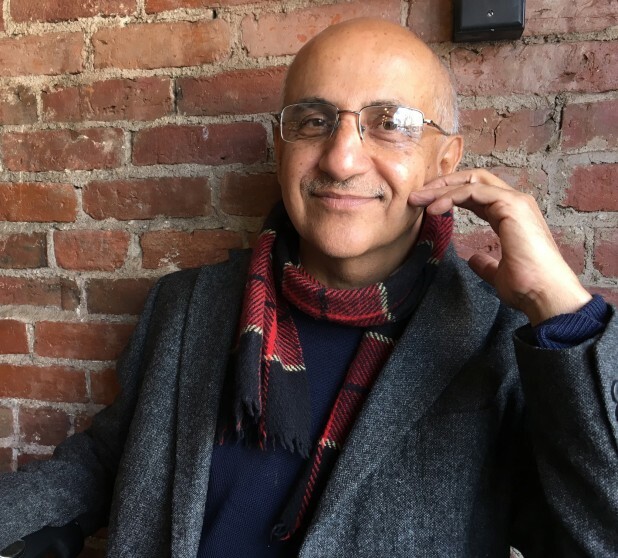 That was when I, like so many others, first heard of Harsh Mander – his essay ‘Cry, My Beloved Country’ (later expanded into a book calledFear and Forgiveness: the Aftermath of Massacre, Penguin India, 2006) was widely shared via email in those pre-social media days. Shortly afterwards, he left the IAS, and since then has devoted himself full time to activist work and teaching. When he visited Karachi in 2004 with the ANHAD delegation, I and my colleague Asadullah Khan produced a series of panel discussions for Geo TV with the Indian visitors, which went a long way towards shattering stereotypes and misconceptions about ‘the other’ in Pakistan. Since then, Mander has continued steadfastly along the same path, building bridges, countering stereotypes and doing what he can to fight injustice. When we met in Boston before his lecture at Tufts University in March, the activism at Jawaharlal Nehru University (JNU) in New Delhi where the student leaders were fighting charges of “sedition” was still going strong. Mander is full of admiration for the JNU student union president Kanhaiya Kumar, who “represents youth, idealism, equality, solidarity”. He points out that, contrary to the propaganda against them portraying them as hedonistic, entitled, alienated elites, the JNU students are mostly from disadvantaged backgrounds – “It is disingenuous to paint them as anything else”. He also points to how these students are crossing borders, refusing to only stand up for their “own” people but taking up cudgels on behalf of others, on principles. Kanhaiya Kumar was raising a voice on principle against the hanging of Afzal Guru – as incidentally, had Mander himself, along with Arundhati Roy and many other Indians whom the right wing reviles as “traitors”. Umar Khalid is fighting for tribal rights, while the Hyderabad University PhD student Rohith Vemula, a Dalit student, who committed suicide last year, had raised a voice against the targeting of Muslims in the “Muzaffarnagar riots” and the hanging of Yaqub Memon charged with terrorism. “What we learn from these students is new lessons in solidarity– across borders,” said Mander, quoting Martin Luther King: “Injustice anywhere is a threat to justice everywhere”. The students in India are crossing borders of caste and religion in their expressions of solidarity. These values apply equally to the people of Southasia, who keep trying to connect and express solidarity with each other even as our governments try to demonise “the other” and keep us apart. He talks about the Bhagat Singh Shaheed lecture he gave at Punjab University, where he suggested that the JNU student leaders who have gained prominence in India could, in fact, be seen as this generation’s “heirs and progenies of Bhagat Singh” – ideas he later articulated in an essay about the issue. The polarisation resulting from the “nationalism” debate – who is a patriot and who is not – is not limited to India, of course. A bolstered far right across the world brings together a combination of extreme nationalism and market economy, a trend that Ronald Reagan and Margaret Thatcher began. This has allowed a style of public discourse to develop in our time that is abrasive, strident and over the top; one that catches media headlines. These are important ideas in a world where the media amplify the voices of shrill flag-waving, hyper-nationalists, from India and Pakistan to the US. Nuance is the biggest casualty in the polarised narrative perpetuated in the post-9/11 “you are either with us or against us” era. In India, notes Mander, the election of Narendra Modi to power “represented a country deeply divided”. “If Modi was a statesman he’d have tried to heal – instead, he has made the divide wider and more indivisible,” says Mander who openly and courageously questions the Indian PM’s affiliations with the Rashtriya Swayamsevak Sangh (RSS). A paradox of the flag-waving hyper nationalists in India is that the RSS had refused to fly the national flag in their own institutions, I learn. That model, suggests Mander, should focus “on fixing a broken education system from school to university, and building and expanding effective demand by ensuring that small amounts of money are in millions of hands, rather than relying on FDI and the middle class alone as engines of growth” rather than simply band-aiding it through skill development. What he finds particularly troublesome is how the growing inequality is accompanied by indifference – we must “stop looking away”… from the unpalatable, the ugly, the poor. It’s about “public compassion,” he offers. 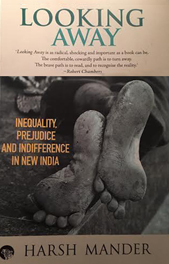 These are ideas he explores in his just-published book titled, aptly, Looking Away – Inequality, Prejudice and Indifference in New India. On the cover is a monochromatic photograph of a pair of feet – apparently lying on the footpath. He has brought a copy for me that I ask him to sign. He obliges and adds a note: “In celebration of a world of new solidarities”. It’s only when I look at the photo on his book cover again that I notice the missing element – a gaping void where the big toe should be. ~ Beena Sarwar is a Pakistani journalist based in Cambridge, Massachusetts. She is also an editorial advisor at Himal Southasian.